We are so excited to officially announce we have reached 1,000 pre-commitments for our RMHCA Specialty Car Tag! Why are we so excited? This means our car tag is finally going into production! 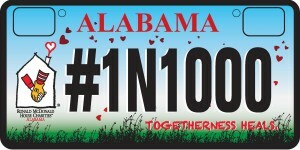 The state of Alabama needs a couple months to make the tag, but then it will be available for you to purchase at your local DMV office. It will cost $50 in addition to the regular motor vehicle registration fee for our specialty tag, but $41.25 of that money will come back to the House. It costs RMHCA $95/night to house one family and with 41 rooms, each donation goes a long way! If you were one of the first 1,000 who pre-committed, you should have gotten an email from the state with the information needed to redeem your free tag for a year. You can wait and redeem it when it is your month to renew, or whenever you want. Keep in mind, if you do it early, you will have to pay when your tag needs to be renewed in order to keep the specialty tag. Visit our Specialty Car Tag page to learn more! Questions? 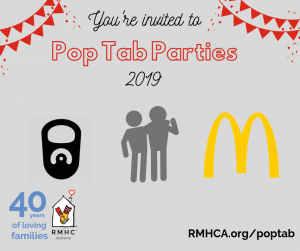 Contact Laurie at Laurie.Smith@rmhca.org or (205) 638-7269. We Hope This Becomes Your Tag Of Choice Throughout The Coming Years.